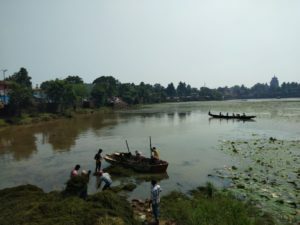 Bhubaneswar: The Bhubaneswar Municipal Corporation (BMC) has started de-weeding the historic Bindusagar lake in the wake of the Bhubaneswar Art Trail-2018 (BAT), coinciding with the Odisha Hockey Men’s World Cup as the 1.3 km trail of art related activities are likely to attract huge tourist footfall between November 18 and December 18. International, national and local artists are going to showcase their best works during the art-heritage-culture interface, called BAT. 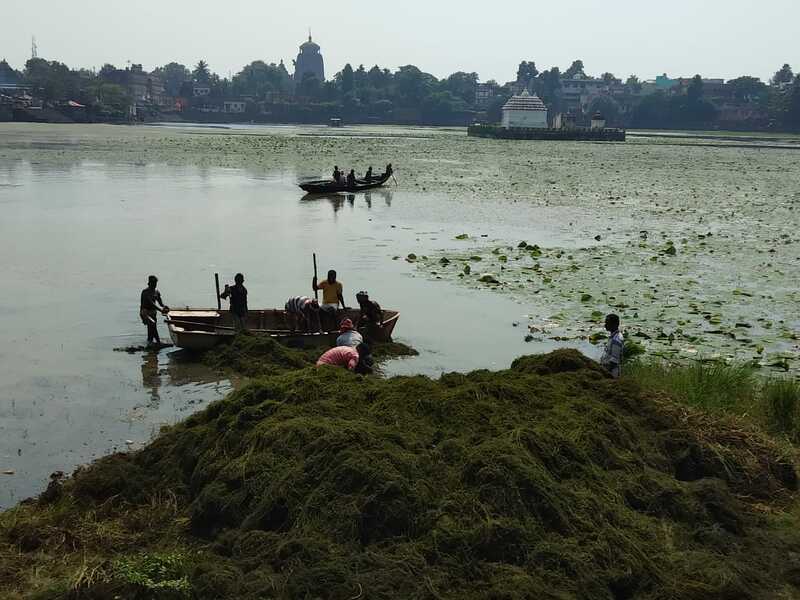 The Division II of the Engineering Section of BMC has take up the cleaning of the historic lake, which is built around 7-8th Century AD and is with an area of about 8.9 hectares or 21.9 acres. It is believed that a dip in the tank before entering into the temple complexes nearby is auspicious and associated with religious sentiments of thousands of devotees, who come on special occasions. The lake is of 450 metre in length and 320 metre in width with average depth between 2.5 metre in Summer to 4.5 metre in monsoons. Now daily 50 workers would be engaged by the agency with adequate boats to clean the weeds from the lake. Later the cleaned weeds would be lifted by tractors to dumping sites. The civic body would invest around Rs 6 lakh for the cleaning of the lake. On the other hand, the private agency engaged by BMC to clean and lift municipal solid waste (MWS) from the Old Town Area, PMR, has intensified its work of cleaning the surrounding areas of the holy water body. 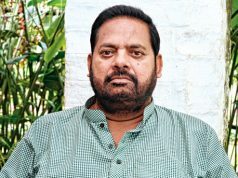 “Besides cleaning the periphery and taking out plastics and bottles from the lake, the private agency also lifts ritual offerings thrown into the lake during Mahalaya or the miniature boats sailed as a ritual during Kartik Purnima. 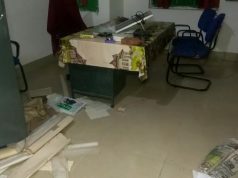 We have asked PMR to keep the surrounding clean as artists would be starting their work for BAT from October 18’’, said City Health Officer Dr. Ramachandra Rout. Interestingly as per a study done by WAPCOS earlier on the holy lake Bindusagar, it has a nice composition of vegetation around itself and there are 33 species of trees, 10 types of shrubs, 37 herbs, 12 grasses, 3 climbers and 4 sedges (grass seen in wetlands). With the “Parikrama’’ around the lake in laterite rock, the holy water body has always been in the limelight and the participants of the weekly Ekamra Walks on every Sunday morning also come to the lakeside to see its beautiful landscape. The famous medicinal plant garden Ekamra Van on its western bank has also become a major tourist attraction.